Rain. Low 46F. Winds NNW at 5 to 10 mph. Chance of rain 100%.. Rain. Low 46F. Winds NNW at 5 to 10 mph. Chance of rain 100%. Tina Little of Albany continues to look for scan vendor's wares while carrying an armful of purchases Sunday morning at the Linn County Flea Market at the Linn County Fiar & Expo Center. 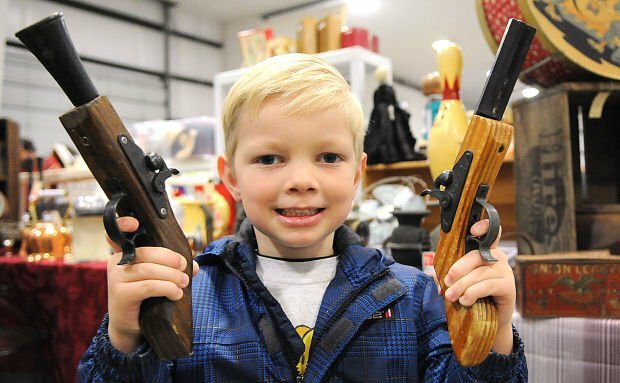 Gagge Seyler, 4, of Albany shows off his new toy blunderbuss and double barrel. Justina Wagenaar of Silverton and Kathleen Ahle of Sublimity sift through a table of bric-a-brac. Hundreds of sports ornaments fill tables at the Linn County Flea Market. Vendors and customers alike were marveling at the size of the venue at the Linn County Flea Market Sunday morning. Billed as the largest flea market in the county the event seemed to live up to its name, at least in the eyes of those taking part. 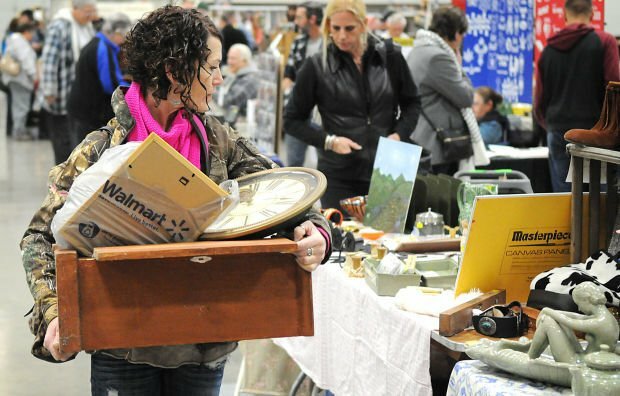 Held at the Linn County Fair & Expo Center, and put on by Josefine Fleetwood, the flea market is an extension of her successful Salem Collectors Market. Sunday Miller was seeking Christmas items but she was also searching for anything that might catch her eye as a collectible. There was plenty to pick from. Fleetwood said that the market has plenty of variety. Sunday’s show featured 115 vendors with a something for everyone. Miller hadn’t claimed the Christmas item she was hoping to find but she had just started her search. Jana Nelson wasn’t quite as focused during her tour of the aisles. “I’m just having fun looking. I guess I’m sort of hunting for a treasure,” she said. Nelson made the trip up from Eugene because she had heard good things about the initial show last September, Fleetwood’s first in Linn County. That show was on a Saturday and the feedback has Fleetwood looking forward to additional markets next year. She will be part of the Heritage Mall’s Antiques and Collectible Show on Jan. 17 and also has two shows booked for May 9 and Sept. 12 next year. “I’m getting requests from vendors and visitors to add to that,” she said. Richard Montgomery of Albany wouldn’t mind if more shows came up. He was looking to add to his various personal collections, including Old Western Americana. Vendors seemed please as well. Ignacio Padilla was in Linn County for the first time. He normally only puts up his table in Salem. Fleetwood said the flea markets normally are on Saturdays and she wasn’t sure if she would offer a Sunday market again. “It’s been a steady stream of people coming in all morning. I’m think the number of people will rise in the afternoon,” she noted. Several nonprofits were set up outside the main flea market area offering items as fundraisers. Fleetwood said she likes the idea of helping fundraise for local charities at each event.